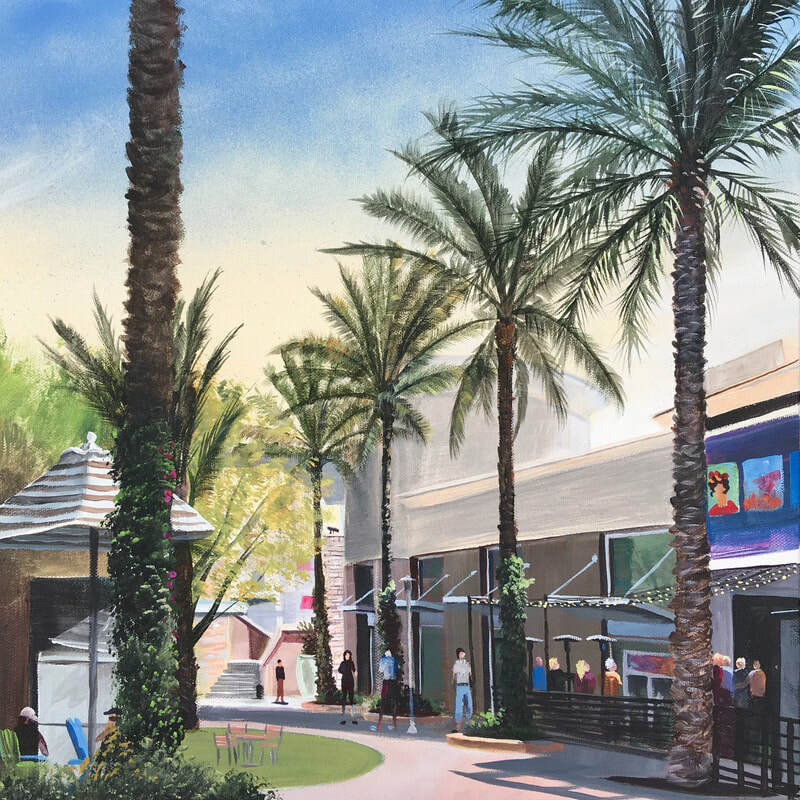 Presented by Vestar Properties (Desert Ridge Marketplace) and the Arizona Business Committee for the Arts, the 2019 Desert Ridge Plein Air Painting Festival provides a unique opportunity for artists to create original painted artworks live and in the open air, capturing the essence of a vibrant retail and community space while inviting shoppers to experience the sight, sound, and even texture of the plein air process. Over 20 artists will compete in the painting competition with $1600 in prizes and a chance to become part of the official Desert Ridge Plein Air Gallery. Additional activities include a Youth Plein Air competition, free painting activities for kids, onstage drawing and painting workshops, and an auction of previous festival paintings. ​Contemporary plein air artists capture moments in time that reflect the ever- changing colors, light and shadows, temperature and shifting elements. This art form requires stamina, focus and the ability to be completely absorbed in their work regardless of their surroundings. As a core Business and Arts Integration method, the Desert Ridge Plein Air Festival festival provides unique opportunities for community-driven creative experiences in public spaces. 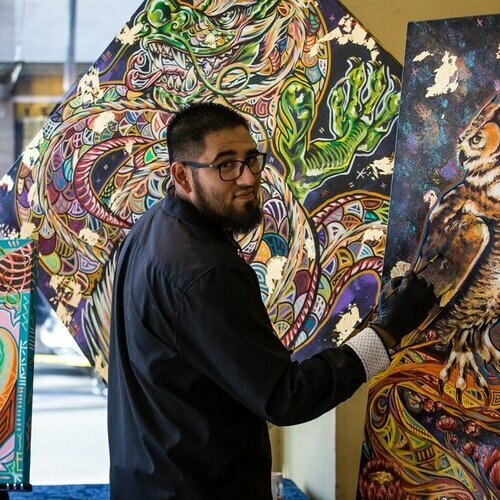 SAACA supports this unique arts approach to expand opportunities for local artists to exhibit, develop and showcase their craft in the community while simultaneously giving youth and emerging artists the opportunity to participate in the arts in a new way. 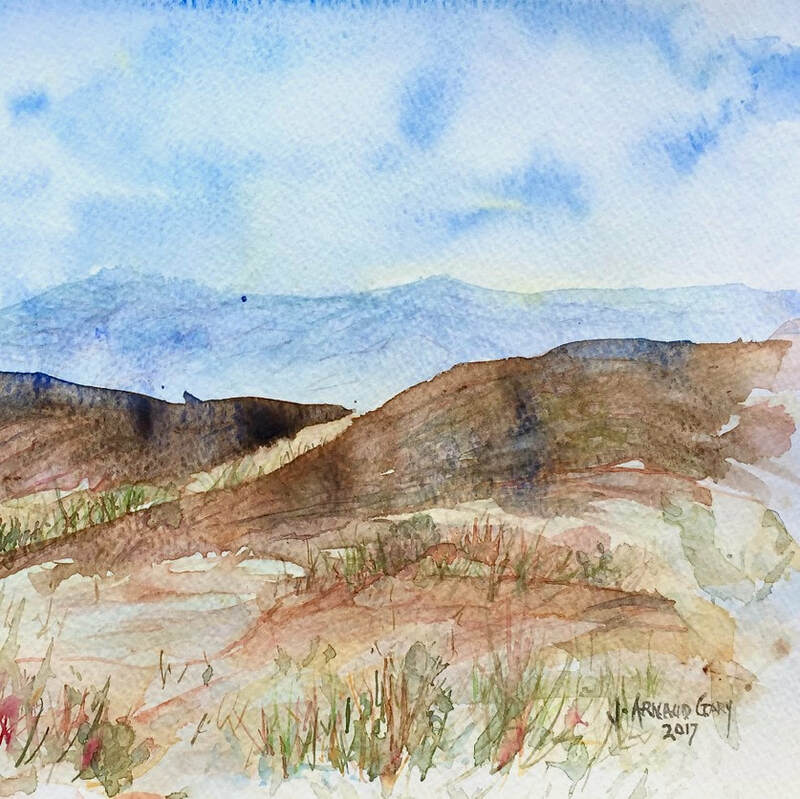 Desert Ridge Plein air painting is a great idea to create art in the open air meet with shoppers and other artists​. I am constantly exploring new and interesting art forms, discovering new ways of expressing myself in the process. I believe this self discovery is an ongoing process that will always keep me interested and challenged and helps me grow as an artist and a person. The best thing about plein air painting for me is observing the natural color and form from real life of different subjects instead of painting from a single view of a photo that doesn't possess accurate or changing colors. 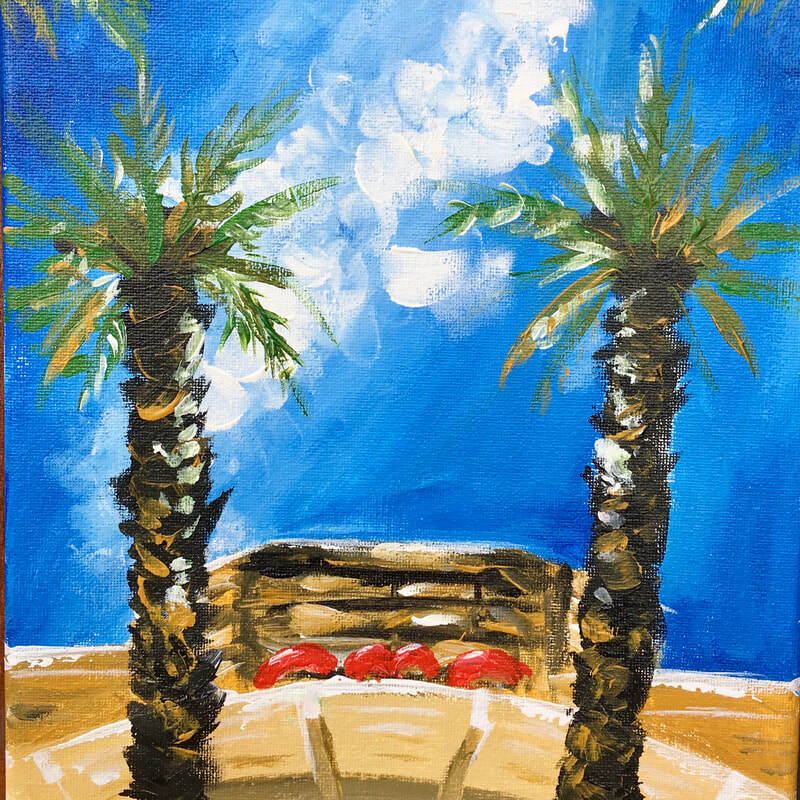 I enjoy painting the desert all around Phoenix as well as the Grand Canyon and Sedona areas. I enjoy the learning curve of producing art live as well as connecting with people and enjoying creativity with others. I enjoy meeting new artists and interacting with the community while painting in plein air. Unlock your creative process with fast, mini sketches that help capture your vision. Usually about the size of your thumb, thumbnail sketching is a great tool for the planning stage of any painting. Take visual notes, workout ideas, and form layout possibilities for your composition. Learn how to use simple patterns and guidelines to block in realistic proportions for the face and head. Practice a simple but effective drawing technique that uses lines, points, shapes, and planes. Use One Point Perspective to find the horizon line and vanishing point in your painting site to capture dramatic and realistic compositions. Use fun and fast gesture drawing practice to quickly capture lively gestures and poses of people in action. Step into painting “in the open air”! …A great way to enjoy and experience the great outdoors. This workshop will be a beginner’s guide to Plein Air Painting. The festival competition is open to any artist who paints using the Plein Air technique in oil, watercolor, acrylic, or pastel. Plein Air (open air) paintings are executed outdoors from real life, as opposed to being painted from photographs in a studio. Both artist and subject must be outdoors, and photographs are NOT used. 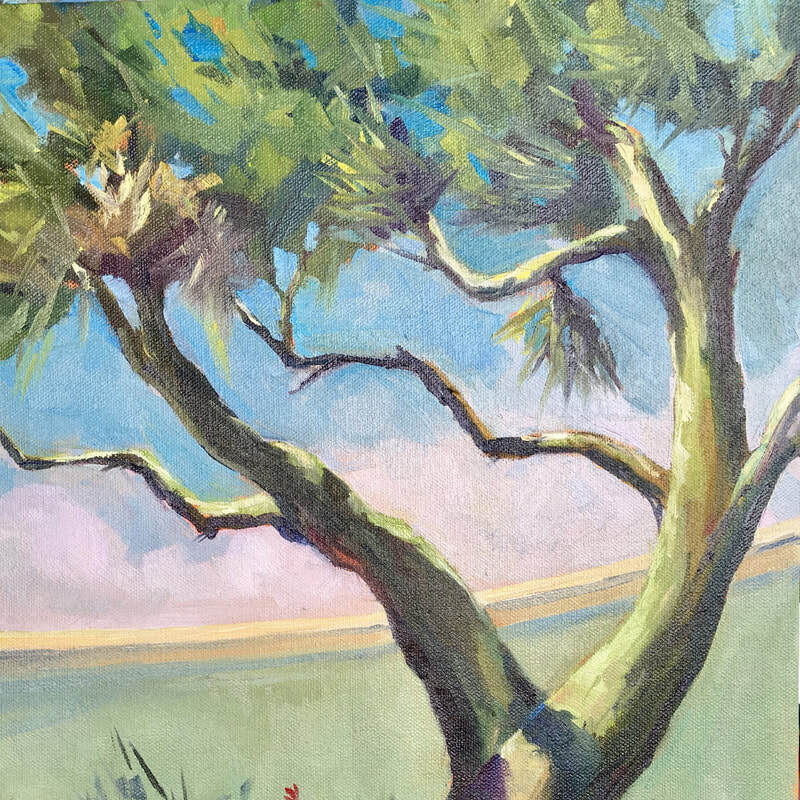 Contemporary plein air artists capture moments in time that reflect the ever- changing colors, light and shadows, temperature and shifting elements. This art form requires stamina, focus and the ability to be completely absorbed in their work regardless of their surroundings. The FREE youth workshop and plein air competition is a component of the Desert Ridge Plein Air Festival (9 AM - 5 PM) which will offer a unique opportunity for young, student artists to create original painted artworks live and in the open air, while being provided hands-on guidance from professional artist instructors from the Scottsdale Artists School. The winner of the Youth Plein Air Workshop will receive a $100 prize and have the opportunity to become part of the official Desert Ridge Plein Air Gallery! The workshop will take place from 12 PM - 1 PM near the KidsZone. The Youth Plein Air workshop is festival competition is open to youth artists age 10-18, painting using the Plein Air technique in oil, watercolor, acrylic, or pastel. To ensure each participant is given the necessary guidance and one-on-one attention the Youth Plein Air Workshop will be limited to 20 participants maximum. Registrations are accepted on a first come, first served basis, pre-registration is encouraged. All artists will be paining subjects or scenes outdoors within “The District” location of Desert Ridge Marketplace (see below map). To prevent congestion and ensure event spread throughout the Marketplace, up to 10 painters will be allowed in each of the 4 zones. Preference for zone selection will be given based on order of selection at registration. Artist registration, judging and awards announcement will be held near the Desert Ridge Marketplace stage in Zone 2, near Dave and Busters. All canvas/panels/paper must be stamped PRIOR to painting. NO unstamped art will be judged. An unlimited number of canvases may be stamped but no more than two (2) can be submitted for the competition. Only the following mediums will be accepted: oils, acrylics, watercolors and pastels. Students (age 18 and under) may utilize canvas, panels, paper in various mediums such as pencil, crayon, pen or ink and may submit unframed completed artwork. Artists must provide their own materials and a sturdy easel(s) for display during the judging process. Each work of art must be started and completed, "en plein air", on March 9, 2019, between 9:00 a.m. and 3:30 p.m. on the day of the event. The event will be held rain or shine. In the event of inclement weather we encourage artists to come prepared. Size of unframed artwork is not to exceed 18" x 24". Participation is open to all. Artists under the 18 of enter are welcome to enter the Youth Plein Air Competition. Artists will be responsible for the safety of their paintings. Arizona Business Committee for the Arts and Vestar Properties (Desert Ridge) shall assume no responsibility for loss or damage to any work, display or person during this event. REQUIRED REGISTRATION: All artists must register and have their canvas, panels or paper stamped prior to any work being done. (No exceptions). Artists that register early will be included in advance festival marketing and have onsite signage printed with their name and website. Zone selection for the festival is decided on a first registered, first basis. There is no Registration fee to participate. Artists are encouraged to bring business cards and interact with the public while their art remains on display. The festival will print onsite signage for all artists that pre-register. Paintings must be delivered to the judging site (The District Stage) by 3:30 p.m. on Saturday, March 9, 2019. There will be no late entries accepted. Each artist may submit no more than two (2) finished paintings to be judged. Each entry must be on stamped canvas. Each finished painting submitted must be signed by the artist on the front. The "Plein Air Stamp" provided at registration must be visible on the back of each painting at the time of submission. Paintings must remain on display from 3:30 p.m. to 5:00 p.m.
All judging is final during the competition. ​Award payment will not be presented on the day of the event. All funds will be disbursed within 30 days.